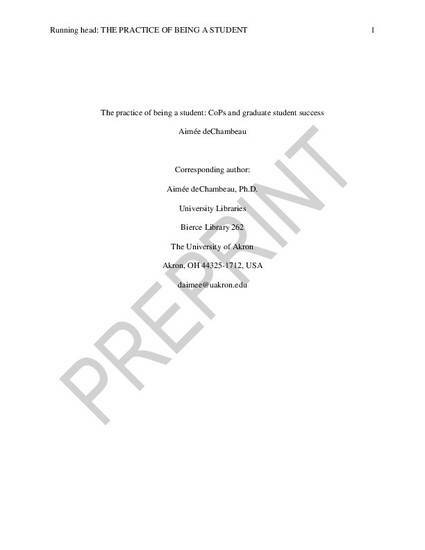 This report frames the major results of recent research into graduate student success using a community of practice model based on the work of Jean Lave and Etienne Wenger as the organizational framework and lens for analyzing collected data. The goal was to determine if a community of practice developed among doctoral students and if so, whether it aided the students in their role and practice of becoming, and being, successful students. An examination of the first eight doctoral cohorts in a hybrid low-residency, self-directed graduate education program determined that student CoPs can develop to support students’ success in the practice of being students. An important emergent finding from this study is that when a community of practice first forms, the opportunities for students to talk about and otherwise share their experiences, especially across cohorts, are fundamentally important to the development of that community. Without opportunities for students to connect and bond, the power of sharing stories that help them navigate from novice to experienced and successful student is diluted by a community system that is too weak to sustain connections—especially intergenerational connections—significantly enough for a community of practice to develop and sustain over time. Institutions interested in fostering CoP development among students should recognize and nurture these opportunities. Jacquie McDonald & Aileen Cater-Steel (Eds.). (2017). Implementing Communities of Practice in Higher Education: Dreamers and Schemers. Singapore: Springer. deChambeau, Aimee. (2017). The practice of being a student: CoPs and graduate student success. In Jacquie McDonald & Aileen Cater-Steel (Eds. ), Implementing Communities of Practice in Higher Education: Dreamers and Schemers (395-422). Singapore: Springer.